On her first day at the Grow Food Northampton Organic Community Garden, Sara dragged herself from her car to her plot on her elbows. Buddy, her chocolate lab service dog, guided her progress, and held steady as she leaned on him to stand up and retrieve her tools. She arrived at her plot just as sunrise dusted the tips of her budding vegetables with morning light. 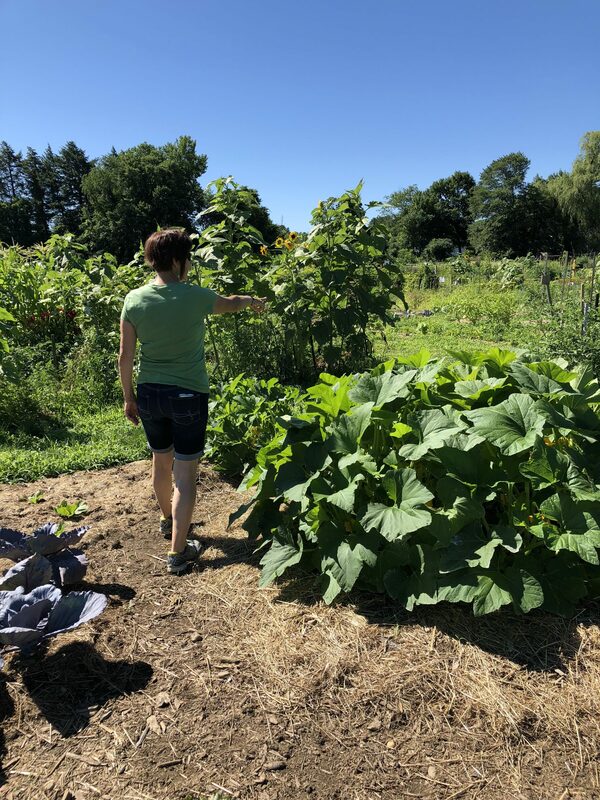 She was there before the summer heat could deplete her strength as it can for people living with Multiple Sclerosis, MS.
Our Garden has 290 plots and over 350 community gardeners on 6 acres of the 120-acre Northampton Community Farm along the Mill River. Founded in 2012, the garden draws from the diversity of Western Massachusetts. We had a few policies and protocols in place to support folks living with disabilities. 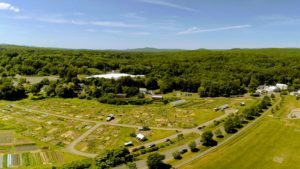 When Sara registered in 2016, we found a plot that was relatively easy to reach from her car, and close to resources such as water, the outhouse, and the garden shed. The rest was up to her, or so we thought. Throughout the summer of 2016, Sara and Buddy were early morning fixtures in the garden, creating a plot that burgeoned with healthy produce. The grimier Sara got, the more she glowed. By midsummer she was able to walk from her car to her plot, using Buddy’s steady strength to navigate. Buddy was the consummate garden dog. Off duty, he made as many friends as Sara. On duty, his total focus was Sara. She credited gardening, and Buddy, with her renewed vigor. 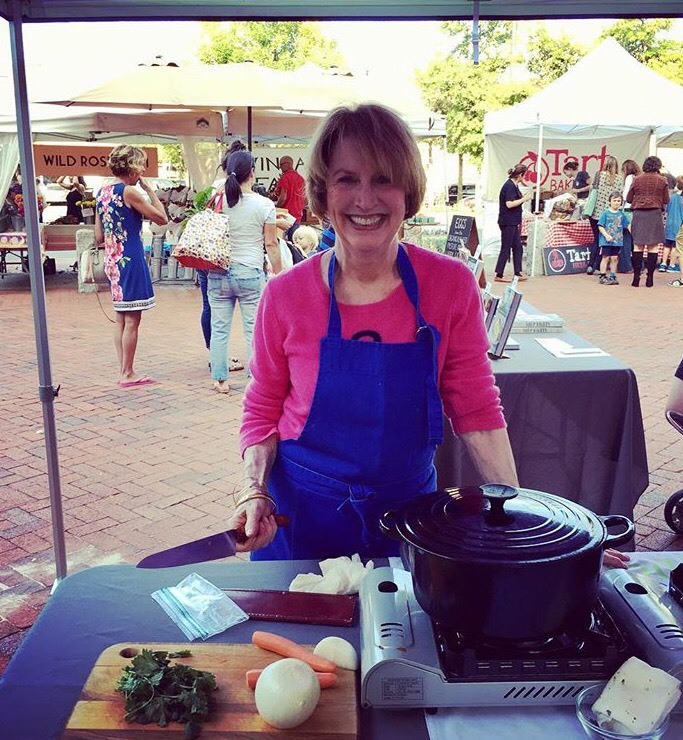 She was active in the Garden Advisory Committee, a leadership team that organizes educational programs, helps with orientation for new gardeners, and advises the garden manager on programming and policies to foster and build community. MS is a tricky disease. Near the end of the season, Sara’s strength diminished. Several garden neighbors contacted me in my capacity as Garden Manager, worried about the weeds taking over her plot and spreading to their gardens. They wondered if Sara was okay and mentioned that they missed seeing both Sara and Buddy. Sara worried that she would fail the final plot check because she didn’t have the strength to tidy up at the end of the season. To make things worse, Buddy suddenly fell ill and died. Sara with Buddy’s predecessor, Gus, at the garden. At the beginning of the next gardening season, Sara decided to give up her plot. She had a sweet new service dog, Gus,but as we went into one of the hottest seasons ever, Sara worried that she couldn’t be able to keep things going. Community gardeners often decide to give up plots because of illness or injury, childbirth, family crises, and other life challenges. Sometimes they reapply for plots once the challenge is resolved, but often they leave the community. Sara’s good-bye email made me wonder if we could do better. An idea was born. Sara kept her plot. 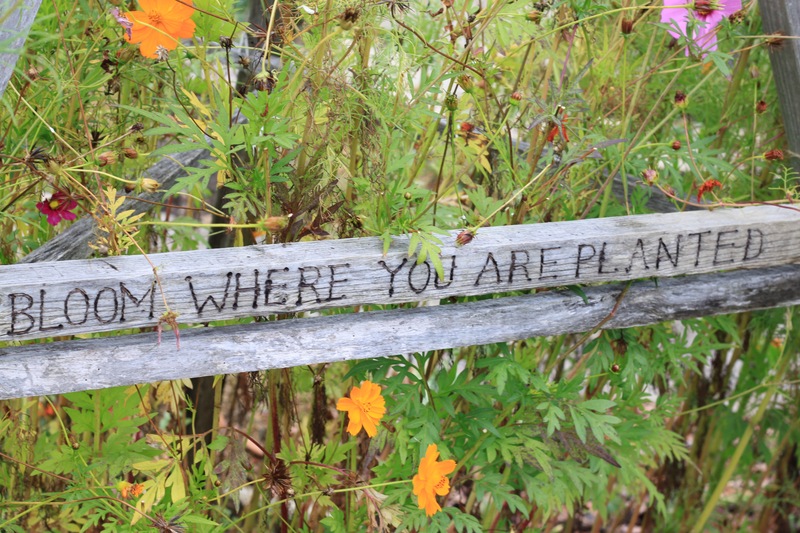 Like many community gardens, we ask each gardener to commit to several hours of community service each season. 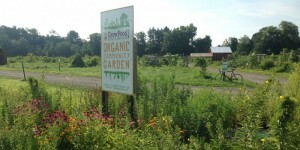 Their service maintains the garden and builds community among gardeners. In 2017 we launched Garden Buddies, named for Buddy and his steady support of Sara’s first season as a community gardener. 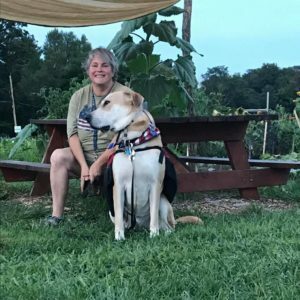 Sara and her new service dog, Gus, made it through the 2017 season, mostly on their own steam, sometimes with the help of Garden Buddies who received community service credit. That summer half a dozen other gardeners needed support while going through chemo, facing bereavement, dealing with ailing family members, having babies, or dealing with their own illness or injury. Most were able to return to their plots and finish the season. Many hadn’t met their Garden Buddies before. 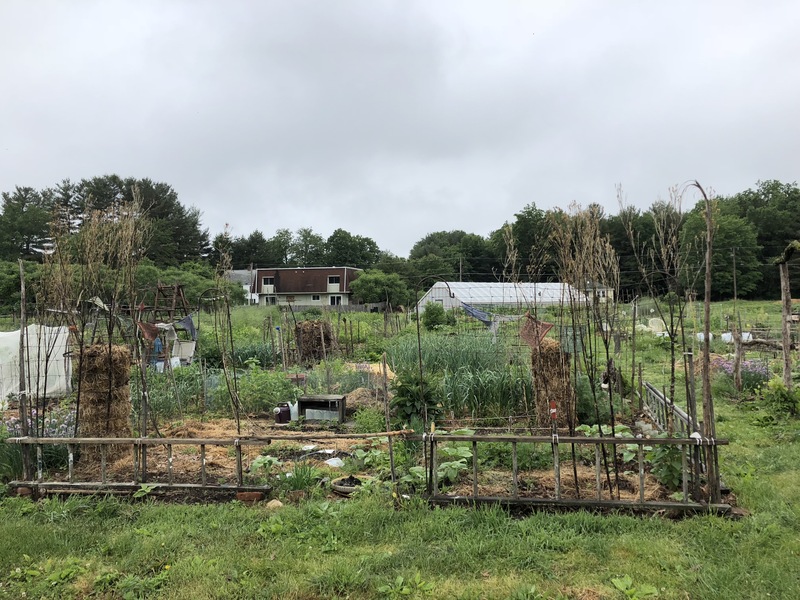 Several volunteered to be Garden Buddies for others, and some even donated their community service hours to gardeners who whose crises meant they would not complete hours. Now, at the beginning of each season, gardeners have the opportunity to sign up to be “on-call” as a Garden Buddy. When a gardener requests assistance, the garden manager makes the introductions and offers some prompts to help them negotiate the relationship. Gardeners requesting support specify what will be helpful in terms of watering, weeding, tending plants and harvesting. 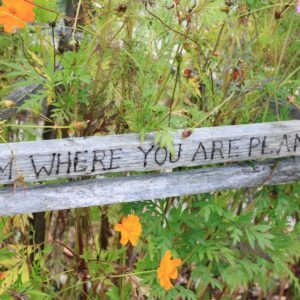 There have been a few missteps and miscommunications that have helped refine the communications, but for the most part the program is playing a positive role in helping gardeners stay in the garden. It’s a simple idea: neighbors helping neighbors through a difficult time. It is hard to ask for help. We are seduced by the myth of individualism and independence in our culture. We are ashamed when we cannot manage the unmanageable. I’m a bit chagrined that we took several years to find a simple way to invite gardeners to ask for and offer help, but pleased that it is part of Sara’s legacy that we do so now. Nothing thrives in isolation, including gardeners. Gardeners know that interdependence is the key to the health of their plots. The interactions of soil, microorganisms, bugs, water, sunlight, gardener and plants are all necessary. They need each other to form a healthy ecosystem. 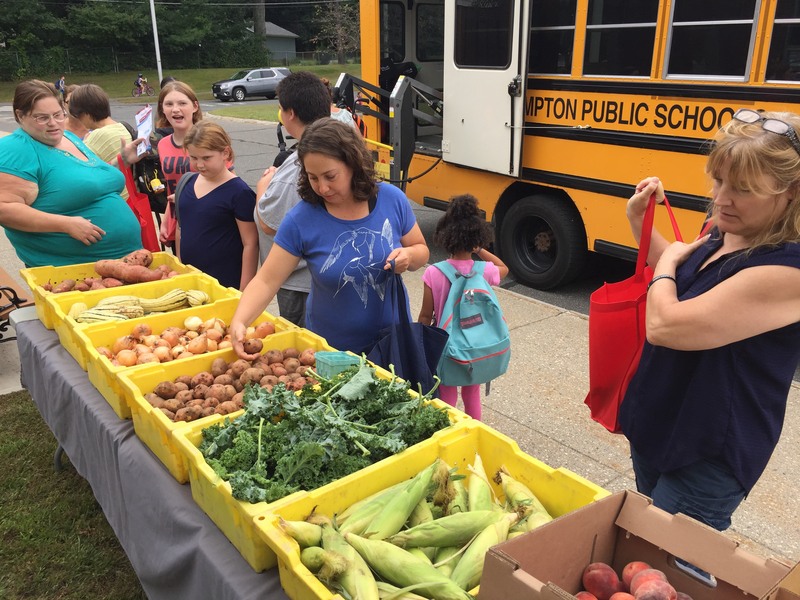 Community gardeners need each other to form a healthy garden. After Sara finished the 2017 gardening season she suffered a stroke. During her hospitalization she was diagnosed with terminal cancer. Sara passed away in May, 2018. She left a powerful legacy. Everyone needs help from time to time. Everyone can offer help from time to time. 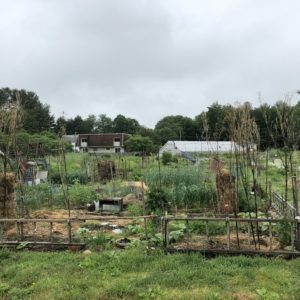 Sara’s openness about her desire to garden and her generosity in accepting help from other gardeners, sparked a program that has deepened the connections in our garden community. Kite photo of the garden by Reid Bertome-Johnson.